Those who are perpetually outraged by real or imagined ethnic slurs and slights were strangely silent last week when the Senate’s Democratic Majority Leader Harry Reid went out of his way to tell two racially charged jokes at the expense of those of Asian heritage – at an even sponsored by the Las Vegas Asian Chamber of Commerce no less. Asian Chamber of Commerce Director James Yu brushed off the comments saying Reid has been a longtime friend of the group, which was established in 1986 to promote political, social and economic parity for Nevada's Asian Pacific American entrepreneurs, according to its website. Yu said he hadn't heard any complaints from attendees about the Senator's comments. "Someone is making an issue out of a nonissue," he told The Associated Press. A spokesman for Rep. Judy Chu (D-CA), the chairwoman of the Congressional Asian Pacific American Caucus, declined to comment about Senate Majority Leader Harry Reid’s racially insensitive jokes about Asians. However, as our friend Matt Boyle of Breitbart observed, the Congressional Asian Pacific American Caucus's website says it will “denounce” any “racial and religious discrimination affecting Asian Americans and Pacific Islanders." Then again, the Congressional Asian Pacific American Caucus is all Democrats, some of who have no obvious ethnic or cultural ties to the Asia Pacific region, so they probably prefer to give Reid a pass as long as he keeps the Senate in gridlock by killing all the bills the House Republicans send over. One group that did not give Reid a pass was the Asian Pacific American Advocates, which released a statement blasting Reid for his “racist and disgusting” comments. “Senator Reid’s comments are offensive and racist to Asian Pacific Americans. He falsely assumes that our communities continue to perpetuate the model minority stereotype, when we have been actively working to highlight the vast socioeconomic disparities within our communities,” the group wrote in their statement. We will pass on following up on Reid’s comments about the President’s diction other than to observe that we find it amusing that Reid would note an obvious bit of hypocrisy as one of Obama’s strengths. 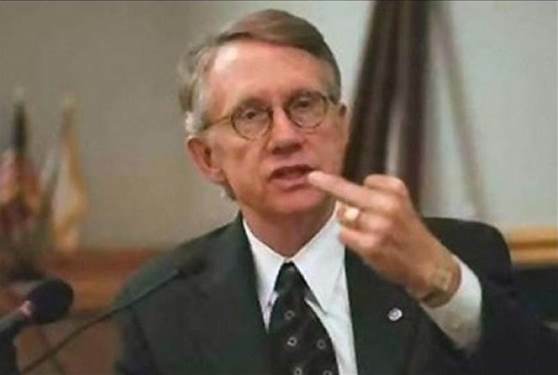 We’ve often wondered how such a thoroughly unpleasant person as Harry Reid manages to keep getting re-elected to lead the Senate Democrats. From our perspective these weren’t merely linguistic blunders or Freudian slips on Senator Reid’s part, he had to go out of his way to actually think this stuff up. The precedent of Trent Lott’s loss of his Senate leadership position for a racially insensitive comment, ought to disqualify Harry Reid from holding such a prominent position in national politics, but Reid gets a pass because perpetual outrage about real or imagined racial slurs and slights is the almost exclusive province of the Left and liberal Democrats, and they are not about to hold one of their own to the same standards they wish to impose upon Republicans and others hapless enough to blunder into their sights.